Tango is a huge part of the culture in Buenos Aires and there are countless shows held across the city each evening. A Buenos Aires tango show allows visitors to experience this intense dance form firsthand, and usually features an upscale dinner. Enjoy a leisurely ride down the river and take a rest from the hectic city environment. 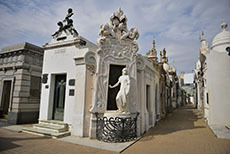 The hub of the Recoleta neighborhood -- one of the city's swankiest addresses -- is the Recoleta Cemetery, where the ancestors of the city's aristocracy are buried. Begun in 1822, this amazing cemetery is a virtual crypt city of tall and elaborate tombs and mausoleums covering four square blocks. Get acquainted with Buenos Aires during a wakling tour that highlights the cityâ€™s major neighborhoods, buildings and attractions. 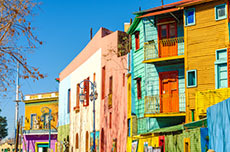 Don't miss the colorful roads of La Boca and the major public buildings around Plaza de Mayo! 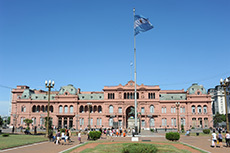 The city's stately historic center includes the Metropolitan Cathedral, dating to the 18th century, and a host of majestic buildings including the Casa Rosada, the pink palace where Eva Peron addressed adoring crowds from the balcony. 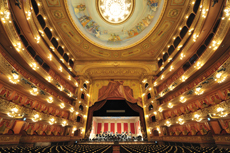 The Teatro Colon is highly regarded as one of the best theaters in the world. Notable for its acoustics and the artistic value of its construction, it turned 100 years in 2008. Reopened in 2010, it's better than ever. 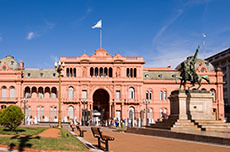 Plaza de Mayo: The city's stately historic center includes the Metropolitan Cathedral, dating to the 18th century, and a host of majestic buildings including the Casa Rosada, the pink palace where Eva Peron addressed adoring crowds from the balcony. The May Pyramid, guarded by tall palm trees in the center of the square, commemorates the 1810 revolution. The square is the setting of modern-day protests, including an encampment of Falklands War veterans calling for pension rights and by the Mothers of the Disappeared, whose children were abducted, tortured and killed by the military regime in the 1970s and 1980s. Recoleta Cemetery: The hub of the Recoleta neighborhood -- one of the city's swankiest addresses -- is the Recoleta Cemetery, where the ancestors of the city's aristocracy are buried. Begun in 1822, this amazing cemetery is a virtual crypt city of tall and elaborate tombs and mausoleums covering four square blocks. It's one of the city's most visited attractions. The monument most people seek out is the simple dark marble crypt belonging to the Peron family, where their most famous daughter, Eva Peron, the wife of late President Juan Peron, is buried. The heroine of the city's working class now rests surrounded by the very families who once despised her lower-class origins. The cemetery's Gothic and art nouveau monuments have more elaborate and fascinating tombs, some with tragic stories attached, and it's worth a couple of hours' exploration with a guide. On weekends, don't miss the colorful crafts and souvenir market that takes place around the Plaza Intendente Alvear, just below the cemetery, an event livened by street performers. La Boca: Many of the city's first Italian immigrants settled this neighborhood, building corrugated iron houses along its cobbled streets. It is also said that the tango was born there. Now it's home to artists, who have painted the metal houses in bright reds, yellows, blues and greens, an echo of the former inhabitants, whose poverty led them to use paint remnants for decoration. Lively Caminito, a multi-hued pedestrian walkway, is a marketplace for artists and craftsmen and a block where you are likely to see couples doing the tango for tourist dollars to the tune of a guitar or the traditional accordion known as the bandoneon. Today it's given over almost completely to tourism, with every shop selling overpriced tourist tat and restaurants offering up mediocre fare. It's an essential stop on every tourist itinerary, but no longer represents the Buenos Aires of today. The atmosphere changes at night, and it's advisable not to go wandering around here after dark. La Boca is also home to the Boca Juniors, the most famous soccer club in Argentina. You can admire the stadium from afar or take a guided tour. Graffitti has long been a major urban problem in BA, and to tackle that a few years ago the authorities designated a number of warehouses as blank canvases for street artists. The result: Truly stunning street art from local hero Ron Martin to international street artist, Bansky. The best way to see this is on a guided bike tour. Parks and Gardens: More than 8,000 species of plants from throughout South America can be found at the botanical garden in Palermo. It adjoins the Buenos Aires Zoo, known for its white tigers. Also, the adjacent Tres de Febrero Park features 1,000 strollable acres with rose and Japanese gardens, lakes and meandering streams. The park is a great people-watching spot on Sundays. Not so much a park as an eco-reserve, the Reserva Ecologica Costanera Sur, is a vast area of wetlands, containing, lakes, pampas grass, willows and shrubs and is home to more than 200 bird species alone. 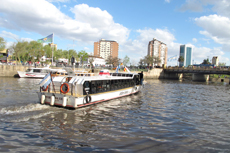 It's a few minutes' walk (or cycle) from the city center and is adjacent to Puerto Madero and the River Plate. It's crisscrossed by cycle paths and is a perfect spot for cycling, walking, picnicking or just getting away from the hectic city. Tango: No one should leave Buenos Aires without taking in a tango show. The Argentines have perfected this dance to its most seductive and romantic. Small, intimate tango bars can be found throughout the San Telmo and La Boca districts, but the larger shows frequented by tourists at places such as La Ventana, Esquina Carlos Gardel, the Las Vegas-style Senor Tango or El Viejo Almacen (voted the no. 1 show on TripAdvisor), are also wonderful spectacles. Expect to pay in the region of $80 per person, which includes a three-course dinner and a one-and-a-half hour show. The ultra-hip Faena Hotel in Puerto Madero offers a smoldering show, Rojo Tango. If you are smitten and want to learn the dance, spots such as Le Catedral in Almagro and Complejo Tango offer lessons, guaranteed to be a fun experience.